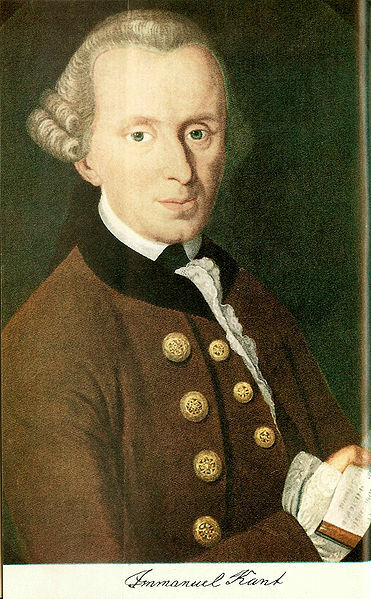 Immanuel Kant (1724-1804) is one of the most important and influential modern philosophers. He was born in Königsberg, the ancient, seven-bridged Prussian capital which became, in 1945 (after deportation of most of the German population to the Gulag archipelago), the bizarre Russian Baltic enclave of Kaliningrad. It is said that Kant never traveled further than 10 miles from his home town in all of his 79 years. It is also said that Kant, who was a lifelong bachelor and a caricatured embodiment of stern Prussian sensibilities, never deviated from his schedule by a single minute, so that local townsfolk could ‘set their watches’ by his daily walks. However unlikely (or apocryphal) these stories remain, they do not diminish the legacy Kant has left to the world of ideas. Considered somewhat of a ‘late-bloomer’, Kant’s first major work, the Critique of Pure Reason, appeared in 1781 when he was 47 years old. In this monumental treatise, he attempted to reconcile the empiricism (from experience) of David Hume with the tradition of idealistic philosophy, by way of his new definition of the capabilities of knowledge derived from ‘pure reason’ alone. I am more interested in examining the basis of morality Kant describes in a short follow-up work, the Groundwork of the Metaphysic of Morals, first published in 1785. This work first described his idea of the ‘categorical imperative’, which would be dealt with in much more detail in his next major work, the Critique of Practical Reason. First, Kant presupposes that there is a moral law. That is, there exists some basis for morality beyond subjective description of it. He then begins with a series of identifications to answer how the moral law possibly gives a pure abstract form of a moral law that will ask if it is really moral. He says the only good thing that exists without qualifications is a good will (or good intentions). Other things may bring goodness, but always with qualifications. For example, happiness is a good thing in itself, but if there is a qualification that a happiness could be caused by harming someone, it is no longer good. Or perhaps we could say that someone is very ‘good’ at making money, but this does not necessarily imply overall ‘goodness’ (in the case of Wall Street banks, for example). This is a somewhat circular argument, in that he says that what is inherently ‘good’ (or moral) is a ‘good will’. He, thus, further defines it as: a good will acts for the sake of duty alone. In other words, a good will does the right thing only for the reason that it is the right thing, and for no other reason. Not for happiness, personal gain, personal inclination, but only because it is ‘the right thing to do’. Kant sees this duty to ‘do the right thing’ as a triumph of reason in the struggle over superstition. But what is ‘good will’? And how can we know what our ‘duty’ is? And will there be problems with always doing this ‘duty’, no matter the extenuating circumstances? Well, Kant begins to answer these questions with another circular argument, saying that ‘duty’ is when someone acts in accordance with the ‘moral law’. This does not appear to clear up the confusion at all, if duty is defined by moral law, and vice versa, and we’re back where we started from. Kant continues, however, by proposing a solution in the form of a universal moral law that can be inserted as a sort of formula to determine the correctness of any particular action. This solution is called the ‘categorical imperative’. The categorical imperative can be basically defined as “Always act so that you can will the rule of your action to be a universal law.” It is ‘categorical’ because it is not ‘hypothetical’ or ‘contingent’ on anything, but is always and everywhere ‘universal’. That is, there is no “if” clause to any moral act, but only the imperative clause (*not: you should do X if Y; but: you should do X!). It is called an ‘imperative’ because it is a command, not an option. So this means that, for every action you perform, you could potentially create a universal rule based on that action. Your action and the universal rule would be equally true and representative of ‘goodness’, or morality. The categorical imperative must meet these demands: it must be universal and without restrictions; and it must be reversible. There are no proper names or group distinctions allowed in any context of a moral rule, either to attribute with praise or with blame. There are no unique exceptions, and it can be applied on a universal level to everyone equally. Kant draws four principles from the categorical imperative. The first is the ‘ends’ principle, that says, “Always treat others, and yourself, as though you were an ‘end’, and never a ‘means’. Basically, don’t use other people! Secondly, “We must always act under the practical postulate that our will is free.” Don’t make excuses or refuse to act because you think that your actions will not make a difference. It is ‘practical’ because our everyday decisions are borne out as a result of our free will, and because we recognize that our actions result from such practical decisions. Thirdly, “Always act so that you can regard your own will as making universal law.” This means that when we decide how to act in a given situation and choose the action (with our free, autonomous will), we would want everyone else to act just as we did. The autonomy of this decision leads to personal responsibility, and excludes any other reason to act that was not from our own free will. For example, if God himself ordered you to do something, and you followed the command, it would not be moral because it was not derived from your own free will. Morality comes only from the decisions you make, and not from decisions that are made for you by others. (For what it’s worth, Kant, like many Enlightenment thinkers, was a Deist, and believed that Reason alone was our most important attribute). Finally, Kant says that “Human capacity to be a moral agent gives each human dignity.” This dignity gives unconditional worth to every human being. In this last principle, Kant understands that there is the possibility (or ‘capacity’) for anyone to act morally, and describes what this action would look like in practice. It explains why we are hesitant to try to put a value on a person’s life, and why most people would refuse to even attempt such a thing. Money, in this case, would introduce a ‘conditional’ value that is not permitted in Kant’s view. With these four principles, Kant describes how a moral individual would act using the categorical imperative. If there is to be something called ‘morality’, this is what it would look like according to Kant. If all individuals acted this way in accordance with his principles, there would result what he calls a “Kingdom of Ends.” In this kingdom, everyone would treat everyone else as an ‘end’ rather than as a ‘means’, and everyone would grant everyone else his own autonomy or free will. This kingdom would be one in which no one gets ‘used’ by anyone else. This is the end-state result of Kant’s morality, and one which he believes would lead to universal peace. If everyone on earth thought the same way as Kant, this might be true. An objection to this system was first raised during Kant’s lifetime. The objection pertains to Kant’s assertion that telling the truth must be universal, and that lying cannot be considered ‘moral’ in any contingency or circumstance. For the sake of argument, using extreme examples is the clearest way to make a point or find a weakness. In this case, then, imagine that a group of Nazis comes to your door and asks if you are hiding any Jews, or if you know the location of any Jews. You are hiding a family of Jews in a secret basement. Do you answer truthfully to the Nazis, or do you lie to them in order to save the Jewish family? I think almost all of us would assert that we would lie to them, believing that the lie was based on benevolent concerns that outweigh the supposed morality of the universal ‘truth-telling’ imperative. Kant, however, denied that this apparent contradiction proved any inconsistency with his original formulation of the ‘moral law’. According to him, moral actions do not derive their value from the expected consequences (in this case, presumably saving the Jewish family, or sending them to their doom), and that it is required to tell the truth to the Nazis. If we lie for any reason, or for any expected outcome, we are only treating the recipient of the lie (in this case, the Nazis) as a ‘means’ to another ‘end’, which denies the rationality of the other person and, thus, denies the possibility of the existence of rational free will at all. Another objection to Kant’s main argument here is that it depends on what someone is willing to ‘will’ to be a universal law. So, in the case of the Nazis, would we be willing to ask them if they considered their actions to be moral (from a corresponding universal law), and to accept their answer? When the Nazi in question inevitably replies ‘yes’, Kant’s only reply is to say that this is not the act of a rational moral agent. The universal nature of Kant’s formulation means that it is only stated on the most general level, without any specific content or qualification of certain situations (which are, of course, disqualified from being ‘universal’). Kant seems to have created a system of ‘fairness’, but one which is not usually ‘practical’ for real moral decision-making. This is especially true when we try to consider the ‘right’ thing to do in regards to other factors that influence decisions in real life, such as our human relationships, family, race, class, nationality, etc. Therefore, drawing on the two objections stated above, we can easily imagine many likely negative outcomes from following the ‘categorical imperative’. A person who either believes he is following his ‘moral duty’ as based on a universal law, or who believes he is following his own personal ‘morality’, could be empowered to commit any number of atrocities that would have conceivably be prevented without the presence of the person’s ‘false’ universal moral law. For example, in the 1961 trial of Adolf Eichmann, Hannah Arendt describes how the captured Nazi leader stated that he had only been doing his ‘duty’ by facilitating the massacre of the Jews. Eichmann implied that he had at least attempted to live his life based on his idea of morality as given through the categorical imperative, and led to what Arendt called ‘the banality of evil’. Another instance in which we can imagine such as thing is the case of religious extremists who believe in the supposed universality of the ‘moral laws’ dictated by their holy books or the clerics who teach them, that they are willing to commit horrible acts of murder and even suicide in the name of what they believe (quite strongly, obviously) to be a universal moral law. With such practical objections apparently sounding the death knell (or perhaps, the ‘knell’ in the coffin) of Kant’s idea of morality, we must look further into these questions to decide where he went wrong. Does there really even exist an idea of universal morality, or is it something that humans invent and construct based on our present knowledge and understanding of the world and human nature? Are there better systems of morality we can discover or describe, and is there anything we can salvage from Kant’s system? In order to attempt to answer these questions as much as possible, and to attempt to find a practical system of morality that works in our own society, it is necessary to first examine the competing idea of ‘Utilitarianism’ formulated by Jeremy Bentham and described most famously by John Stuart Mill, which will be the subject of my next post.